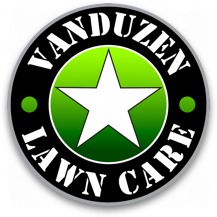 VanDuzen Fence proud to announce the opening of our lawn care division to help service your lawn care needs. Serving Fort Erie, Niagara Falls, Welland and Port Colborne. 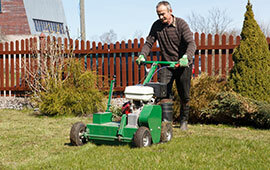 VanDuzen lawn care prides itself play going the extra mile to provide you with a superior service and quality for a lawn you can be proud of. We are able to meet the needs of both large and small residential and country properties with our professional regularly maintained equipment to ensure the best cut possible every time. Our weekly lawn maintenance service includes grass cutting, trimming and blowing off the driveway and walkways of grass clippings. 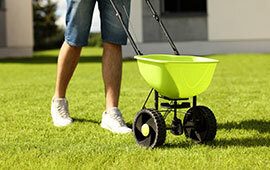 We mulch and leave grass clippings on your lawn for a natural fertilizer to help promote healthy growth. If your lawn is looking a little thin this will help you get oxygen to the roots and old grass to decompose faster for a more nutrient rich lawn. 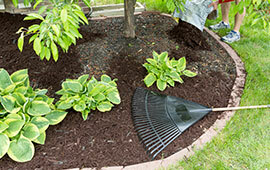 We can add mulch to flowerbeds to help keep moisture in and weeds out. 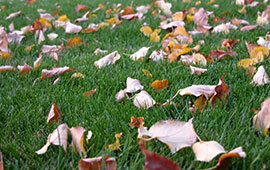 We remove the leaves from the entire yard including your flowerbeds. This is usually done in the spring and fall.